How can art and culture promote health and well-being? What does a social art residency looks like? How can artists work in prisons, elderly care homes, hospitals or other non-traditional environments? Welcome to a conference where you can explore and discuss the prerequisites for an art residency from your own professional point of view. The conference is meant for artists as well as anyone working with this topics. Stefan Klaverdal worked as artist-in-residence at Ängelholms rehabilitation clinic for six months in order to investigate how art and music can influence and improve health care. 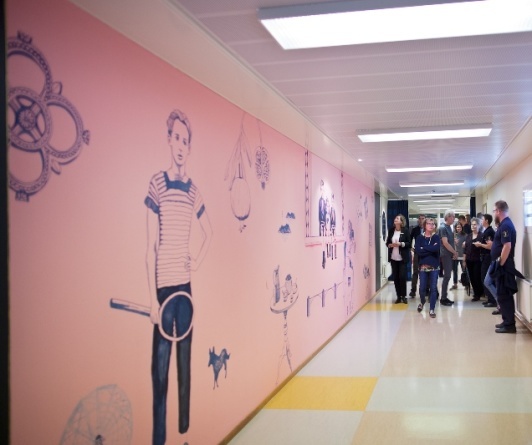 During his stay he created several new works which he performed around the hospital premises. Among other things, he composed relaxation music for physical therapy and created a sound installation with birdsongs for one of the care units. Stefan will share his experiences from the residency at Ängelholms hospital. In 2015 the headlines told the story of ”an artist who got admitted to psych”. This artist was Marie Bondeson. While admitted, she investigated the psychosis ward by assuming different roles: a nurse, a curator and a patient. The idea was to collect material for a design project for spaces under construction in the hospital. Unfortunately, the work was never realized, although a publication was released. Marie will share her experiences while working in such a closed environment, the obstacles faced but also the opportunities for creating change. Lasse Lundqvist have a long experience working in artistic projects with marginalized groups. In the three-year project “Skaparkraft” (“Creation strength”), funded by The State Inheritance Fund, he created, together with Sound Artist Margit Schiött, a method for artistic work with refugees and young people with disabilities. The method became a success and has been furthered used with a variety of groups including elderly people suffering from dementia. Lasse will introduce the method and other projects he's been involved with. 14.45 – 15.45 Workshop: How can we develop well-being residencies in Norrbotten? What are the challenges and the opportunities? "Well-being Residency Think Tank" is an international project that brings together professionals, experiences and know-how with the aim to investigate the role of an artist in non-traditional settings such as social and health care. The focus is to create new collaboration models that can give birth to new art residencies. NB The conference will be in English | The workshop will be conducted both in English and Swedish. The conference is free-of-charge and the organisers offer lunch and coffee. Note that the registration is binding: if you fail to attend the conference, a fee of 300 kr will be charged.